Posts Tagged as "greg stephens"
Back in February, Curtis Silver joked about “doing the math homework mind meld with your geeklet” in his Wired/Geekdad write-up of a post I’d written about how to help your kids with their math homework. 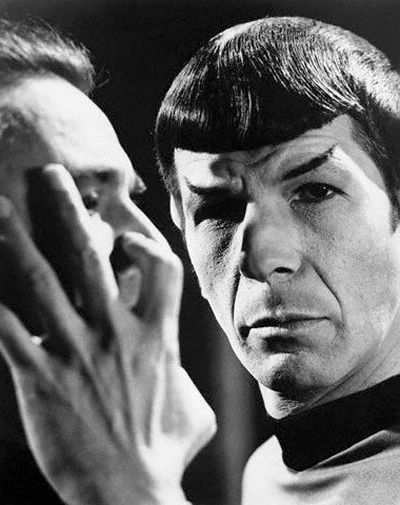 Now it turns out that scientists have discovered that mind meld actually happens during conversations! Using a special type of MRI device, researches at Princeton University imaged the brain activity of a student as she told of two personal experiences—a troublesome encounter with a police officer after an accident, and of two boys fighting over which one would take her to the prom. Researchers then scanned the brains of several subjects listening to the stories. Listeners who followed and enjoyed the stories quickly synchronized their brain waves to the speakers’. But if the listener didn’t like or understand what was being said, this effect disappeared, and brain patterns decoupled. “That feeling we all have with people, that feeling of ‘clicking,’ might actually have a real neural basis,” researcher Greg Stephens tells LiveScience.com. The effect goes beyond the parts of the brain used to process language; during a good conversation, people will unconsciously begin imitating each other, using similar sentence structures, speaking rates, and physical gestures and postures. In fact, listeners can get so tuned in that they even begin to anticipate what the speaker is about to say. These new findings bring to mind an experience I had with a great teacher named Nick Bernardino. Not only did Nick excel at “tuning in” to his students, but he’d also teach “mad libs”-style. He’d deliberately leave out part of the sentence so that students were forced to fill it in. When I was on the receiving end of this technique, I found myself silently filling in the blank with facts I thought I’d totally forgotten and hadn’t thought about in years. Is the brainwave synchronization discovered in this study what allows this experience to occur? These findings also remind me of experiences I’ve had with my best teachers, as well as something I’ve noticed with many of my own students. When you spend time with someone who is confident, relaxed, and engaged with what you’re learning, you become more confident, relaxed, and engaged with what you’re learning. Even if you’re working on a subject or skill that originally was very stressful! This makes me wonder, could synchronizing your brain waves in one-on-one conversation with a good teacher allow students to access states of consciousness they hadn’t experienced before? Is “mind meld” helping my students to access their previously undiscovered or long-lost “happy math place”? Five fun ways to help your kids learn math this summer (online)!